I love hawker food. 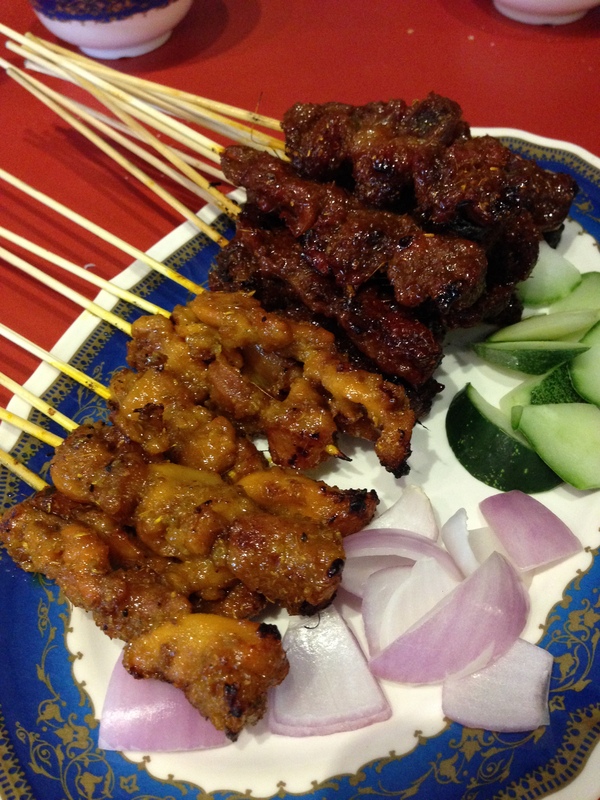 Singapore’s street food culture is truly amazing and there are places one can find a great meal for less than USD$5. Any time of the day. Of course, the problem comes when trying to navigate food options when you are on a strict low carb diet. How low carb? Well, I try to aim for about 12 – 15 g of carb per meal. Just to put it into perspective, 1 bowl of rice contains approximately 44 g of carb. And this is the same whether you choose white rice, brown rice, unpolished rice or whatever healthy grain rice you think is part of your “healthy” diet. This is pretty much considered Singapore’s national dish (move over, chilli crab!). 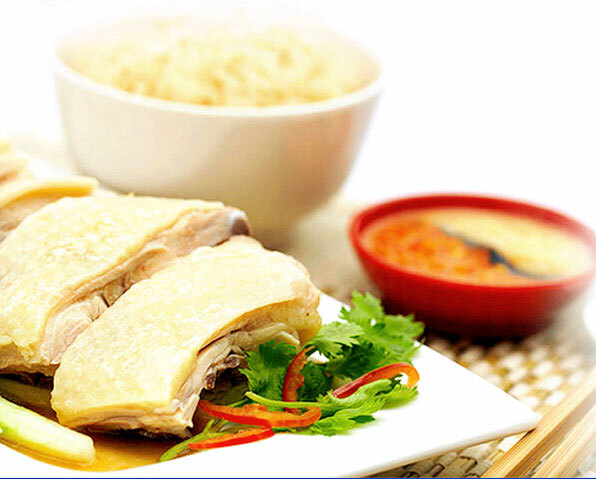 The truth is that it is everywhere and there is nothing as wonderful as the fragrance of the rice with the silky smooth chicken on top. It apparently sits as one of the world’s best foods (CNN 2011). Every element in this dish is absolutely essential, from the fluffy slightly oily grains of rice to the perfectly poached chicken to the chilli and ginger sauce. Making this dish low carb is pretty easy. Just omit the rice. Lest I shock the chicken rice aficionados out there it is not as bad as it sounds. I usually order an extra portion of poached vegetables (most stalls have this option) and have this with the chicken. And most times the chicken also comes with sliced cucumbers, which are also a good low carb side. 3. Watch which items you choose, a lot of the tofu pieces may be stuffed with surimi fish paste which is usually starch based. Try to choose items that are not stuffed or breaded. 4. Choose lots of vegetables for the dish. You’ll be surprised how filling and satisfying this dish can be. 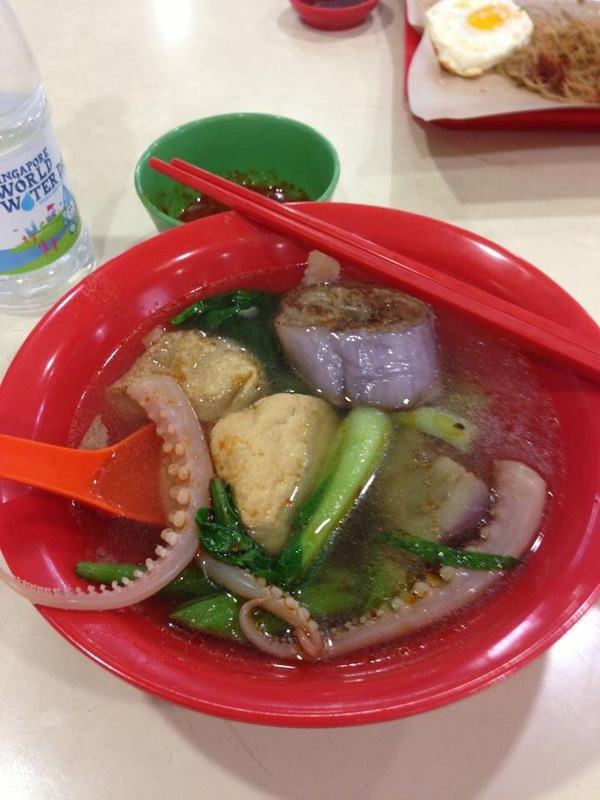 This is one of the ultimate yummy sinful dishes you can have in a hawker center. Originating in Taiwan, the Singapore version is somehow more flavourful and crispy. The problem is that the crispiness comes from potato starch that is added to the egg mixture. The easiest way to make this low carb is to tell the hawker uncle to omit the starch and make you an “orh jian” instead as this only has the egg and oysters. This may cost a little more as more eggs are needed for the non-starchy version. BBQ Sambal Stingray is one of the best things for late night eating. It’s amazing how much food is available late at night in Singapore and also how many people (including kids) are out at night for supper! The stingray is smoky and barbecued and the sambal sauce is slathered over the top with a squeeze of lime. This is sublime and can easily stand on it’s own without any rice. The reason why this dish is served in hawker centres is because stingray was a cheap and not well favoured type of seafood. Not anymore. Because of the popularity of the dish, stingray has become more expensive in this part of the world. 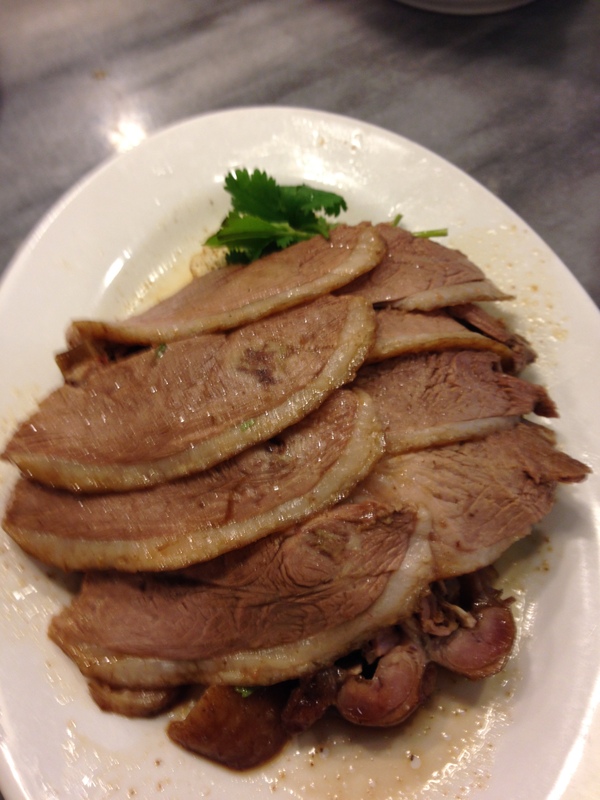 Duck Rice in Singapore is usually comprised of either braised or roasted duck. Braised duck is usually served together with tofu as well as hard boiled egg that has been braised in the sauce from the duck. Rice can be simply omitted in this dish. Alternatively, you can have the duck together with cauliflower rice. Cauliflower “rice” is a brilliant low carb alternative that supports meat dishes or fish head curry and can simply prepared by fine chopping cauliflower and sauteing it with minced garlic and minced onion and a little soy sauce and pepper. Double boiled soups in Singapore are easy low carb options as the soup is steamed on its own and you can omit the option of rice. There are abundant choices, with ginseng chicken and watercress and pork rib soup being some of the hot (haha) favourites. There is something primal about hot soup for the Chinese tummy. Adding herbs to soup is a distinctive of Chinese soups and different kinds of soups are supposed to cover a span of common ailments and health issues. It’s also nice to have this as an eat-out option even though there are pre-packed herbal preparations now that you can use for making the soup at home. Yet another healthy dish that is easily accessible yet healthy and flavourful. Again drop the noodle and rice accompaniment to this dish. A variety of fish is usually used for this deceptively simple dish, such as snakeheads, garoupa, pomfret and batang fish. 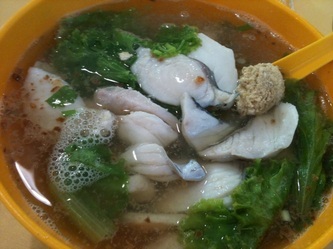 The sinful twist in some stalls is the option of adding fish roe. Some stalls also offer the option of adding milk to the soup but this may not be a good idea if you want to be strictly low carb as milk also contains lactose which is a kind of milk sugar. Some kind hawker uncle or auntie may also give you more vegetables if you ask for it, and definitely if you pay more for the additional vegetables! 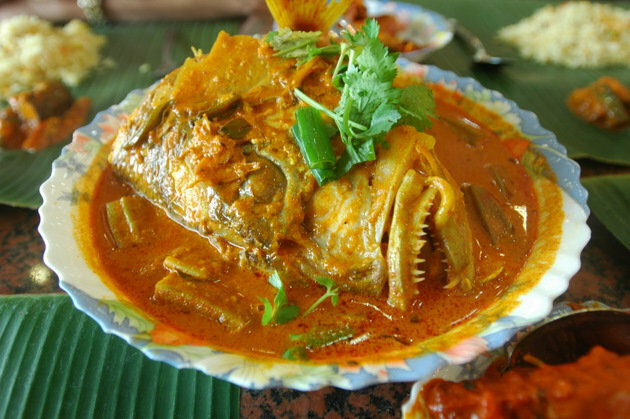 This is a truly awesome dish where a red snapper fish head is stewed in curry with tomatoes, okra and brinjal. There is an Indian fish head curry version and a nonya (peranakan food) version, but my personal preference is the Indian curry version. This is usually served together with rice and vegetables on a banana leaf and papadum. Sticking to the fish and vegetables alone and avoiding the rice and papadum crackers makes this a reasonable low carb option. To be honest, every once a month or so, hubs and I will have a craving and we will gravitate to Banana Leaf Apollo where we often meet people that we know, which only goes to show that Singaporeans share the same cravings at the same time! These stalls offer wok-fried dishes that are great to be shared when going out as a family or with a bunch of friends. These dishes are cooked over truly hot fire and have a slightly smoky fired flavour to them (“wok hei”). 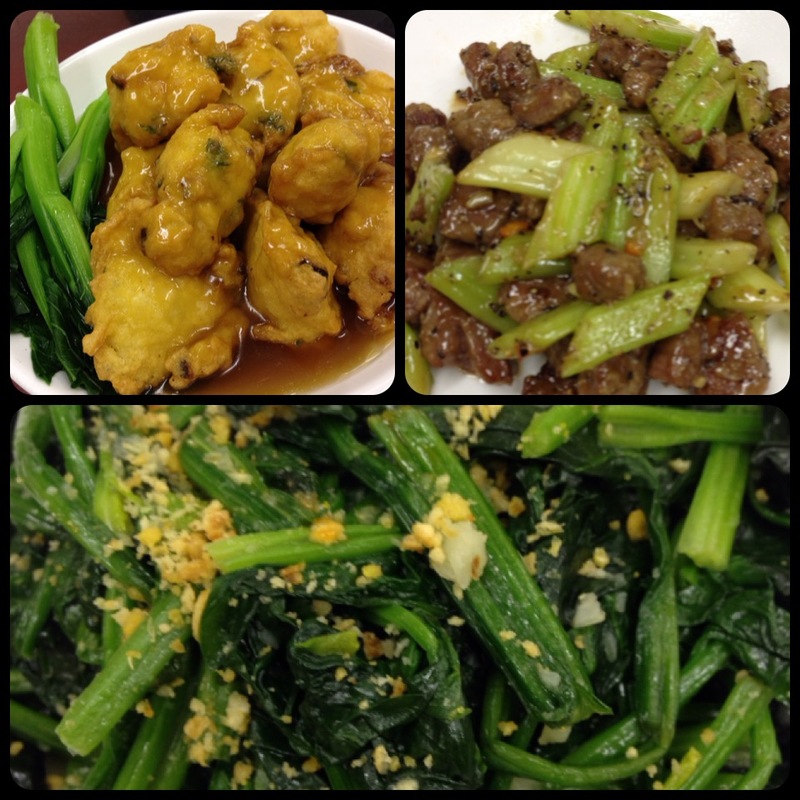 It is easy to choose more vegetable based dishes and just avoid the rice. Stay away from dishes that are fried with noodles. Choose low carb type options such as tofu, egg, green leafy vegetables and non-processed meat. Some zi char places specialise in seafood also. Bak Kut Teh from Food Republic, one of the many food courts in Singapore. This, like the soups mentioned previously, is an easy option as one can take the meat soup only and omit the rice. The pork ribs are stewed in a complex soup of herbs and spices and often contains tofu, fried tofu puffs and mushrooms. Contrary to its name, Bak Kut Teh (or literally meat bone tea) does not contain any tea. The tea was probably a traditional accompaniment to wash down a relatively fatty and oily meal. 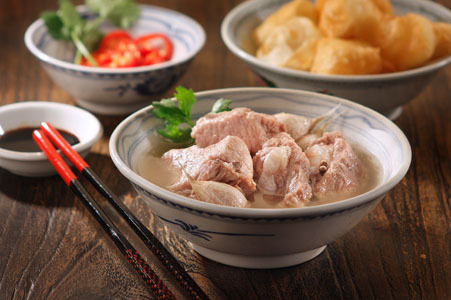 Bak Kut Teh is often served with rice (or noodles) and you tiao (a kind of dough fritter), all of which should be avoided. 1. Avoid rice and noodles (or anything made with flour). Luckily nowadays quite a few people do this and hawkers no longer look gob-smacked if you ask them to leave out the noodles. I’m so glad I live in Singapore and that i don’t have a boring food vocabulary (like pizza and salad, sorry ang moh friends!). Beef Noodles X Omit noodles. Ask for the soup variety and not the dry gravy version as the sauce is usually thickened with cornstarch. Also limit the number of meatballs as these are starch based. Biryani X Strictly modifiable if you take the meat only. Char Siew/Roast Pork Rice X Ditch the Char Siew and keep the roast pork. Take with vegetables. Dim Sum X Slender pickings here – steamed pork ribs and fu pi juan (tofu skin wrapped shrimp and pork mince) are probably some of the few safe dim sum options. Double Boiled Soup X Omit rice. Options like watercress and pork soup or ginseng chicken soup are filling and satisfying. Duck Rice 鸭饭 X Omit rice, take the duck, bean curd and egg that usually comes with the dish. Hokkien Mee X Will post a low carb shirataki version one day! Orh Luah (Oyster omelette) X Ask for “orh jian” or omelette without the starch paste in it. Sambal Stingray X Eat without rice. Satay X Sugar laden marinade and peanut sauce. Teo Chew Porridge X Omit porridge or rice.